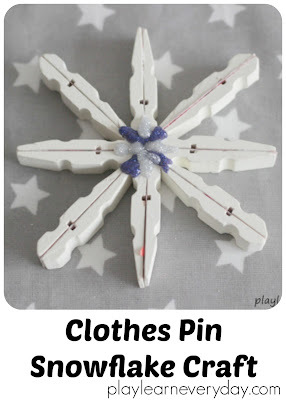 I came across this idea for a snowflake craft and just had to give it a try with the kids. It looks so simple and who would have thought that clothes pins could be so pretty? First remove all of the metal springs from the clothes pegs and place them back to back, then use the white glue to attach each pair to each other. Arrange four of the pairs of clothes pins so that the tops all meet in the middle and glue them together. Glue together the next four pairs of clothes pin sides, this time arranging them between the others with the bottoms sticking in the middle with glue. Finally it's time to decorate your snowflake! Our clothes pins were white already so we didn't paint them, we just went straight for the glitter pens! They were great for reinforcing the glue in between the clothes pins as well as make them look pretty and sparkly. These will look so pretty hanging up on the Christmas tree or just brightening up the room throughout the winter.